In home staging, we sometimes get a lot of inspirations by looking at hotels. After all, there are a lot of similarities to home staging: appeal to as many people as possible, make the rooms feel inviting, warm and making you feel like you can see yourself living in it. As you can see from the bottom photo, the room is fairly long and narrow. This is something we see fairly frequently in condo projects, or one of those bowling alley type of homes in San Francisco. A great mirror is a great styling device to introduce more lights into the room, making the room feels brighter. It will also help to make the rooms seem larger. 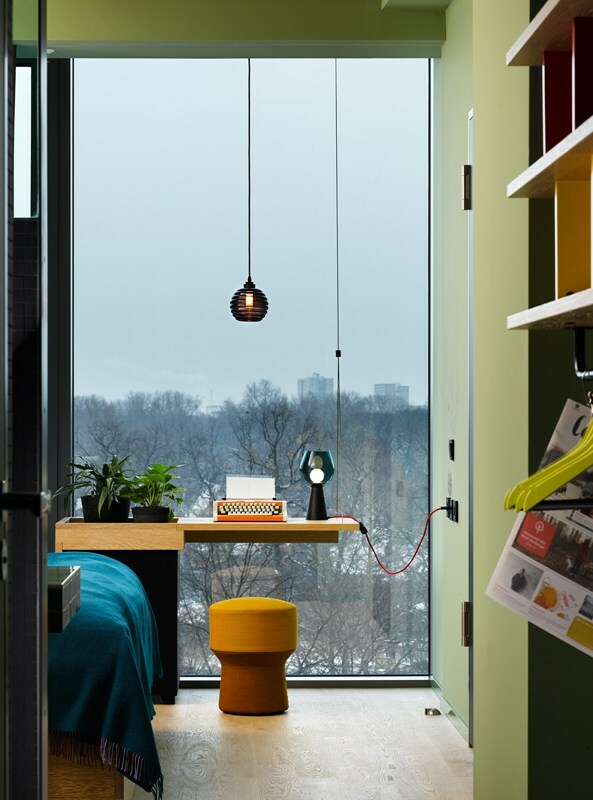 You can create a color palette to create different moods in the room. In this particular example, this hotel’s designer opted for a muted background with black, white and grays, but utilizing a dark plum accent wall or pops of colors provided by the artwork and yellow chair to create different moods. In this instance, this hotel took a total different approach, injecting lots of colors through flooring, furniture and tablecloth, creating a total different look and feel. When you’ve got the view, take advantage of it! When you have a great view, sometimes, that’s all you need. Balance is incredibly important in design. As human beings, because we see symmetry everywhere (for example, our faces), we are naturally drawn to spaces that feel harmonious and balanced. Symmetry is probably one of the easiest way to create that balance in the room. By creating a mirror image, it creates equal visual weight, thus creating a balanced interior. At times, it’s not perfect symmetry. For example, in this photo above, the artworks hung in the left and right arches are not perfectly symmetrical. But because of the visual weights are balanced on both sides, the room feels harmonious and balanced. 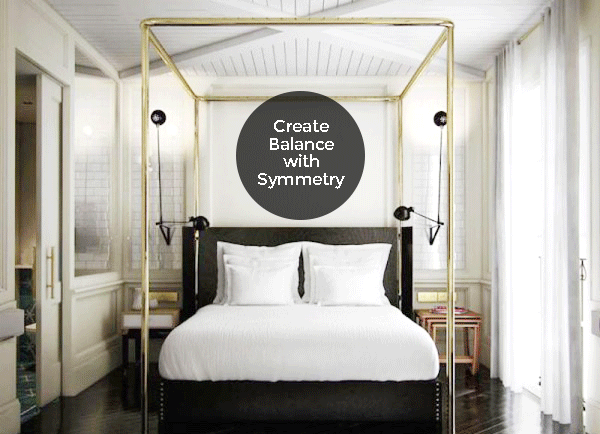 You can utilize this trick for rooms that may not be symmetrical to start, but balance it out with playing with the visual weights. Got collections? Why not turn them into the focal point of your room? Collections thrown together without organization can look like clutter, but if you display them neatly and turn them into a focal point in your room, they can look amazing and can serve as a great conversation starter with your guests. We do this in redesign projects as well. Many homeowners have treasured collections in their homes, but they don’t know how to display them. By having an area where you can proudly display your collection, you can turn your prized possessions into a focal point of the room. Lighting is not just for functions nowadays. Lighting can create moods, ambience, enhance your productivity, and can even be centerpieces in your decor. Contrast is beautiful. By putting a light object in front of a dark background, or vice versa, you can create a very strong impact. Greenery is one of the best decor pieces you can use to liven up the room. It softens the room and brings in life. For example, in the photo above, even though the main color palette is gray & black, the greenery in the room has helped to soften the harshness grays and blacks can evoke. What do you think of our tricks? Got a few up your sleeves? Share them here in the Comment section below!